As we finish up on the other side of OZ, we land in Melbourne for my last pick. KOSHOWKO is the musical brainchild of Polish born Martin K (right), philosopher turned music producer. Martin has spent the last couple of years working in close collaboration with various electronic and dance artists including Disco Stu, B(if)tek, Winduptoys, Severed Heads, I Forget and Valley Forge. The latest incarnation introduces two fresh vocalists, Katie (far left) and James (centred). I met James back in the city of Perth a few years ago when we worked together as actors. Knowing that I'm a musician, James introduced me to his vocalist/performer sister from Melbourne. During an online chat, I convinced her to join me in Sydney for a songwriter's convention (the same one I spotted Lovers Electric at) where we finally met in person. On our bus trip to the event we met electro guru Martin, also from Melbourne. We began talking and immediately clicked. James eventually made the move to join his sister and you know the rest right? History.... with lots of sizzle! Q. Okay KOSHOMOKO (:P) I've given a bit of a glimpse into how you met Katie and James. Do you have anything else to add? A. Well, as you said, I knew Katie from the Song Summit Conference in Sydney. Around the same time two other people I was playing in Koshowko with decided to go and live in the UK and USA leaving me in Australia alone. Then Katie heard somewhere that I advertised for a male vocalist, so she brought her brother James to the audition and although I was initially thinking of working with a male vocalist it's needless to say that both James and Katie got the gig! Which is perfect as Koshowko studio recordings have both male and female vocals featured and this way we can accordingly divide roles when playing live. Q. I've heard your latest EP "Arnachy Mornachy". I danced to it. People know I don't dance. Ever. What did you do to me?! A. Wow, that's a great compliment, thank you Nelson! I’m a fan of catchy melodies especially with a mixture of some minor chords for a dose of melancholy. A tiny bit of a plan we had for this release with other co-producers was to create a record that would have the ability to make people dance but also to preserve a certain 'pop' sensibility when it comes to the melodic structure. Essentially we wanted to have a release which would work just as well for dancing as for say listening in your living room, on your iPod or the latest hi-fi music player. Q. You've said that your music production has evolved from downtempo to more upbeat. What the? Explain Mr! A. 'Anarchy Monarchy' is Koshowko's first EP, a first collection of songs and I consciously chosen more upbeat material for this production. However, earlier, in 2007 we had a debut single release called 'Promise' on Clan Analogue/Creative Vibes. That release was linked to our presence on an electro-dub compilation album 'In Version' and it was kinda required to choose for the single some material that would resemble that album stylistically. So 'Promise' was definitely a more 'lounge' friendly and laid back offering and some good collaborations started for Koshowko through that release. 'Anarchy Monarchy' shows more the music which is closer to my heart, there are more melodies, more lyrics, more structure, the production is more lush and tempos of the songs quite a bit faster. Q. You did some gigs in Europe in December 2007. What are your thoughts on the general scene there compared with the one in Australia? A. We went to Germany in December 2007 to promote 'Anarchy Monarchy' and in the meantime to say 'hi' to our friends and families spread all over Europe. Being overseas shows how different Australia is from places like Germany or England when it comes to opportunities to play live or meet like minded people. 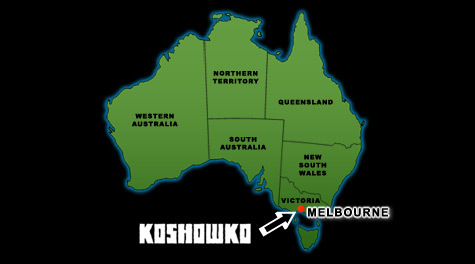 In Australia Koshowko is based in Melbourne, which is generally considered the musical capitol of the country and Melbourne itself is great - a very vibrant place with a lot of opportunities to organise events and play gigs. Australia as a country though is very limited to what you can do with your music, especially in comparison to Europe. Germany has been for many years a place where a great electronic, pop or dance scene is thriving. England is probably even bigger. See how much we have to sacrifice for that great Ozzie lifestyle we have down under, ha ha! A. I love remixing as it's a very liberating activity. As a producer I feel I'm able to take more risks artistically when remixing. A while ago I've done remixes for the Australian femme-tech duo B(if)tek and another iconic dance act - Disco Stu. After months of procrastination they will be finally released on the 'Re Cognition' album later in 2008. There's more remixes that I've done recently and I hope to upload them as soon as legally possible to the just created Koshowko Remixes myspace site. And as I said I love to produce remixes and typically I take on board more projects than I can handle in a short time, so step in the queue please and I'd love to remix your stuff down the track! A. I think it's a great idea for artists to give away some music for free and here's something special just for the readers of your blog. A previously unreleased remix of 'It's Time Now'. It's called 'Dance Logic Remix' and has been remixed by a friend of mine Brian Morris who also co-produced parts of the EP with me. A. Some time ago when a deadline for the EP release was tight I gathered some friends and strangers side by side and that's how the video to 'It's Time Now' was created. I actually prefer "It's Time Now" when it's not remixed. Interesting interview though Nel, and Severed Heads I just feel I gotta go checkout, being almost All Hallows Eve an'all. Nel: you've filled an empty bloggers chair most wonderfully - well done you! - you Kiwi's have a whole new dimension on electro - that I dabble in now and again, so thanks for broadening my music boundaries, by the choices you've made. Lastly how happy was I this morning to learn that "The Presets" have won 3 Arias. Talk Like That remixed by Lifelike is without doubt my favourite song from over the pond so far this year. KIWI? Kiwis are from New Zealand dear.